Anglican priests may no longer have a "job for life" under proposals being considered by church leaders. The General Synod of the Church of England is set to discuss a move to allow the sacking of incompetent or lazy priests at a conference. The present system, known as parson's freehold, only allows bishops to remove clergy over a serious breach of trust. Earlier the synod refused to debate Prince Charles' wedding to Camilla Parker Bowles at its four-day meeting. Church leaders say the marriage is in accordance with guidelines. But some members are concerned about Charles' presumed future role as supreme governor of the Church of England, one of the monarch's traditional titles, believing the fact that he is remarrying will make him unfit to head the church. The changes to the church's Terms of Service would see legal ownership of clergy housing be transferred to local diocese. And priests would be subject to regular reviews of their performance. Its backers say the move would give clergy a proper contract and employment rights similar to the rest of the world. But priests' representatives and trade unions have criticised the proposals. The Reverend John Masding, chairman of the English Clergy Association, says there is no reason to change the current arrangements. He told BBC Radio 4's Today programme: "It would alter the entire character of the Church of England and turn it into a centralised organisation instead of something which is authentically based locally. "In the past the church has benefited from having some wonderful, independent and courageous clergy of real insight." And Rachel Maskell, national officer for Amicus union, called for the synod to ensure that rights at work go "hand in hand" with security of tenure. "It would be unfair if [their rights] fell by the wayside in a row over dismantling parish control of property." 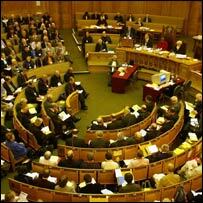 The meeting at Westminster will debate controversial issues such as the ordination of women bishops and homosexuality. But there will be no discussion of the forthcoming royal wedding after calls for an emergency debate were rejected. In opening the synod, the Archbishop of Canterbury Dr Rowan Williams prayed for those "in the glare of publicity". He asked that Prince Charles and Camilla receive "God's guidance and help". The Reverend Prebendary David Houlding, from the London Diocese, urged all members present to pledge their support for the royal couple. He said it was important that the church expressed its "total and loyal" support to them. The delegates then broke out into a round of applause.